The population projections in the Ballard to Downtown Seattle Transit Expansion Study (table 3-4) are very low and the methodology Sound Transit uses to create these projections should be updated. In the past the media has criticized ST for projections that seemed overly optimistic, but then proved valid post-recession. Sound Transit should avoid over-correcting by using excessively conservative estimates now. Beyond helping to decide which routes to build, the estimates will communicate a potential project’s value to stakeholders and make a case for funding to the federal government. The Ballard to Downtown Seattle Transit Expansion Study used a definition of Ballard which covers the area from 8th NW to 32nd NW, the Ship Canal to NW 85th. This includes all of census tracts 30, 32 and 47 and approximately 80% of census tracts 31 and 32 (which extend west to Shilshole Bay). The total population of the five complete census tracts in the 2010 census was 32,502; the 29,580 number reflects the reduction of the western portions of census tracts 31 and 32. The area covered is where all the growth in Ballard has occurred in the past and is occurring now. Additionally, nearly all of the larger development since 2010 has been apartments; there are currently only two condominium buildings under construction. This makes the comparison pretty easy. 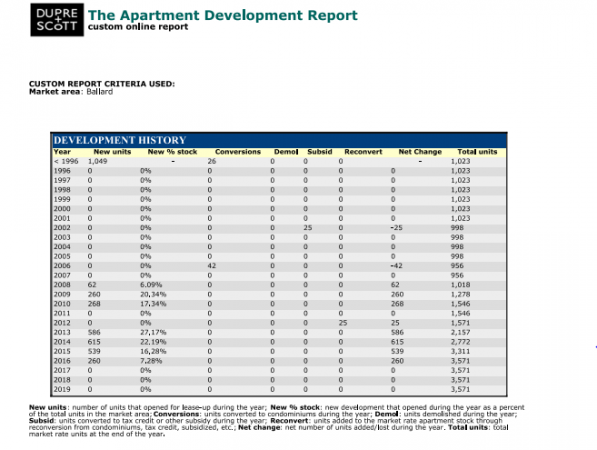 We asked the apartment market experts at Dupre & Scott if they had numbers for Ballard since 2010. For this example, to be conservative we assumed anything built 2009 or before was 100% absorbed and anything built in 2010 was 50% absorbed when the census was taken at the end of that year. We will also assume apartment occupancy of 1.8 people per rental unit and 2.3 people per sold unit per the census numbers for Seattle. Through 2010 there were 1639 apartments total in Ballard. In the years 2011-2016 there are 2000 apartment units either opened or opening. That means there are 22% more apartments opening between 2011-2016 than existed in 2010. Adding the 2010 apartments that were not absorbed yet by the census study, a total of 2134 apartments will open between 2010 and 2016. At 1.8 residents per apartment, this means 3841 new residents in Ballard by the end of 2017, excluding any units built in that year. Ballard will have 33,421 residents by the end of 2017 just due to apartment growth. If we add in the 137 condo units under construction and 108 new townhouses from 2011-present, the total 2017 population is 33,984: passing the PSRC 2035 projection 18 years early. Over the next 20 years, all these figures will likely grow a great deal. Seattle grew by 18,000 people between July 2012 and July 2013. Simply carrying that absolute growth rate forward, 396,000 people would move to Seattle through July 2035. At least some of them will move to Ballard. Though Ballard already rates highly in the Ballard to Downtown and Ballard to UW studies, these numbers are used to communicate the value of the project to stakeholders and to the federal government. Higher population in this area means higher ridership. It is not in our best interest to short population and ridership projections when competing with other cities and states for federal funds or when talking to local stakeholders about how great the need is for high capacity transit to Ballard as soon as possible. Sound Transit is now a mature agency with 15 years of experience delivering projects under budget and ahead of schedule. While it is understandable that an agency would rather under-promise and over-deliver, it should use the most accurate numbers possible to create its estimates. It shouldn’t start out by using artificially low input numbers and a known overly conservative algorithm. The comment period for this study is over, however Sound Transit is now accepting comments in relation to its Long Range Plan. Please ask Sound Transit and the PSRC to review and update their projections based on current conditions so that we have an estimate that is close as possible to what we will really see in 2035. It can help us get better transit faster and have more of it paid for by the federal government. Win – win – win. The comment period for the Long Range Plan ends 7/28/2014. Send your comments to LongRangePlan@soundtransit.org. 1. Update the ridership and population projections in the corridor studies to more accurately represent growth in Seattle and the region. 2. Use the corrected ridership projections to further the case to build the highest quality grade separated subway system possible. If they use PSRC’s predictions they may be wildly off. Ballard is currently at 196% of their “target” growth for 2024, or 397% of their target if you factor in permits already issued. PSRC’s model is broken for Ballard and much of Seattle (overall at 108% of 2024 target when factoring in permits). By comparison, North Beacon Hill is at 1% of it’s target growth. They use PSRC’s updates numbers from 2013 which manage to be under by 18 years on a 22 year projection for Ballard. How many permitted properties end up being built? Do we have any historical numbers for that? Also, taking 1 year’s growth and extrapolating is extremely sloppy. Particularly when that year is much higher than previous years. Seattle typically grows by about 4000 folks a year. And sometimes it shrinks. assuming 18000 a year going forward is not reasonable..
We aren’t suggesting that ST use the straight line method… Just pointing out that WSDOT does in order o justify their projects. The number of permitted units that will actually be built is variable – in this case a large percentage of units already exist, which leaves less cloudiness in the estimation. So, what numbers should be used? Unfortunately PSRC and the city have yet to update those numbers, and ST is not a mini-Census Bureau, MPO, RTPO, etc. This post is primarily an ask to ST to review the accurcy of the PSRC’s projections and push PSRC to update them. 2013 projections should not be this far off. It might not be reasonable, but it’s completely possible. Consider that Las Vegas, Los Angeles, Phoenix, and many other cities in the South West US are unlikely to have enough water in the next 20 years. So unless you have some cheap and efficient desalinization technology that works on the scale of millions of gallons, that issue alone is enough to bring people north. My friend that works at the ASCE mentioned to me in a conversation about “grand engineering projects” that they are working on the problem of moving water resources from one geographic region to another. So, we in the Northwest now have to concern ourselves with California demanding taps to our vast hydrological resources. I’d be curious to know the guest contributors educational credentials to substantiate their claims and discount ST’s work. What’s to say Ballard won’t reach a critical mass and level off next year with apartments vacant? Or rents will be so high that it drives people to other neighborhoods. Real estate has well documented past of building itself into a self popping bubble. And seriously Seattle Subway, what’s the deal with the love affair with Ballard? Ballard is likely where Seattle likely builds its next subway system. That’s a really big deal, both for Seattle and for a group named Seattle Subway. Re: credentials. Possibly a good point, but they aren’t exactly presenting novel data. They’ve presented data from a well-known real estate consultant, and added an opinion about how predictions should change. Neither of those rely on trusting their background – you can decide for yourself if you agree with their opinion. “Ballard is likely where Seattle likely builds its next subway system.” source? For credentials, I’m talking about an educational degree in planning. We can all be armchair planners just like everyone who drives tends to think they are an honorary traffic engineer. And data from a real estate consultant is not what i would call unbiased. Goodluck, ST has made it very clear that a LR line into Ballard is pretty much priority #1 for the North King subarea in ST3. Both DT-Bld and Bld-UW liness produce great ridership, and have been in process for a while. The public comments have also really pushed a Ballard line. I dont think it’s controversial to say that ST will build a line to Ballard. Also, Im a little confused by your objection to this piece. Do you think that people who aren’t transportation engineers shouldn’t be allowed to post here? Or do you have a specific disagreement with the arguement or it’s data? I think you may be missing the forest for the trees. The point is that the population estimates are used to create ridership estimates, and those ridership estimates are then used to justify the Feds spending money so we dont have to. If our population estimates are significantly lower than reality, or even just other more reasonable estimates, then when we send our ridership estimates to the Feds we are screwing ourselves out of free money for no reason. I’m not saying those who arent transportation engineers shouldn’t post here. And environmental planners are the individuals that would be developing the ridership estimates. My issue where some individuals without the educational background in environmental planning boldly cast aside ST ridership assessments based upon real estate professional speculation and straight line growth well beyond the current period of economic prosperity. WSDOT may use that but their study areas are larger and serve larger populations and industries. This blog used to be a great place to read and discuss, in a respectful manner, information about local transit development. At some point in the last few years, its as if credibility has gone out the window and this has turned into a political urbanite “cheerleading” blog blindly pushing forward with growth and transit planning that is out of touch with reality based on assessments by armchair planners. goodluck, You don’t have to be a super genius with a PhD in forecasting to see that PSRCs numbers GROSSLY underestimated Seattle (and Ballard’s) growth. As Matt the Engineer points out above, just in projects under construction and permitted the city has passed it’s 2024 projections. A projection should be most accurate the closer in you are to when it made. After only 2 years of a 14 year long projection PSRCs numbers are so off base with reality as to be worthless. As these projections are the basis of ridership estimates, they need to be accurate. At the very least PSRC needs to rerun their projections based on current reality, I think they should take a hard look at their model since it so spectacularly failed to match the reality of the last few years. Is there any part of that you don’t understand? Im afraid I dont really relate to you anxieties about the changing culture of this blog. Im not sure you can characterize concluding that the ST estimates are too conservative as “boldly” anything. The fact is that there are already enough construction permits issued for Ballard to bring Ballard over its city-planned population for 2035 by 2018. Of course not ALL of those projects will be built, but companies dont get permits planning not to build. Growth is clearly happening much much faster than DPD envisioned. And while a straight-line estimate is clearly bad(though perhaps useful for getting the Feds money, no bad thing), it doesn’t really matter how you model it unless you just imagine that the city completely stops issuing permits for that area for almost 20 years. The population numbers and estimates are clearly out of date, and it behooves us to ask ST to update them, since we lose nothing and may potentially gain more federal aid. The numbers referred to are mostly the PSRC’s population numbers. Their projections are currently off and will be off, by a lot, for a long time, if they aren’t redone. I’m not sure what credentials you are looking for to point out that their numbers are obviously wrong. I’m fairly certain everyone posting pieces on this blog has made it past 5th grade math. Ballard has the two highest value lines (Ballard to Downtown and Ballard to UW) per ST’s study work — its an obvious place to focus on. There aren’t really any other ST3 lines studied by ST have the same ridership potential per cost of construction. For credentials, how about someone who actually works with these models for a living? Lots of people who are very good at something don’t do it for a living. Some people are very good at several things, some of which are more personally fulfilling to them, or more lucrative than working in transportation. @Jon, the type of people you describe are often in the field of politics and/or lobbying. We nerds are good at nerding, and many like to nerd out about a variety of subjects. As editor, I would be reluctant to accept a piece that objected to a model and proposed an alternate outcome without justification. However, this article makes a narrow claim that the layperson can easily evaluate, that is, the underlying population assumptions are low given readily available data, and provides sourcing for their data. All assumptions and methods are clearly explained. There is no argument from authority in this piece, asking you to count on the authors’ specific expertise in population modeling. Just saying “STs models are clearly wrong because I think there will be 100,000 riders in Ballard” would be a terrible argument, but that is emphatically not what Seattle Subway is doing here. Martin, it’s just odd to have a guest post attributed only to an organization, and not an individual. And it’s far too insider to assume every reader commenting on the post knows who is and isn’t part of Seattle Subway. You leave people not even knowing if they’re essentially debating sock puppets—or worse, Schiendelman. STB is better than using an anonymous first-person plural from an organization that only identifies itself as “our friends.” The post should be signed, and commenters who are part of the organization should identify themselves as such. It’s basic integrity. To the lay person, this article seems to imply that we should use current apartment construction figures to plan transit lines for 2035. In this case the numbers are low for Ballard but there are no updated, reliable numbers to use. Anyone can tell you this, but who has a transportation model that incorporates the Ballard boom over the last 5 years? No one. I dont think we can assume the current pace of construction continues forever. I dont think anyone is. I think the point is that the current pace of contruction is going to eat up Ballard’s 20 year growth margin within the next few years. So that margin needs to be revisited. Making projections is hard work. Its like being the weatherman for an economy. And while I dont blame a weatherman for getting the weekly forecast wrong, I do feel the need to correct him if he says that it will only rain 1 inch all week, and its rained 1 inch today, and isn’t stopping. And its the rainy season. A projection can have a great method, but if real life turns out differently the projection should be adjusted. I agree that the projections should be adjusted. But in the meantime, has anyone, anywhere presented an alternate projection for 2035? Jason: Can you point to what your specific issue is with this content? Seattle Subway is an advocacy organization and we are (spoiler alert!) pro subway and transit. We’ve been posting things as Seattle Subway for some time here. We do that becuase these peices are co-written and reflect the opinions of our organization – not just one member. Many people have been involved at one time pr another. Ben S. has moved on from our organization. It’s an editorial. Editorials are signed by an organization, and reflect the official opinion of the organization’s leaders. That’s what the Seattle Times and other newspapers do, and STB sometimes (mainly election endoresments). The opposite of an editorial is a commentary, which is signed by an individual and commits only him/her to that opinion. As to whether Seattle Subway is clear enough who its leaders are, maybe, maybe not. Perhaps it should put them on its “About Us” page. As far as I’m concerned it’s a group of concerned citizens, not an industry shill, and it’s not really important to me which STB commentators they correspond to. What matters is what Seattle Subway does. Good grief. Yes, Mike, I understand the difference between an editorial and a column. The point is the editorial board of the Seattle Times is not anonymous, and its members are in fact listed at the bottom of each editorial. STB likewise has an “About Us” page with names and bios and will often list current editorial board members at the bottom of unsigned editorials and endorsements. Neither example is the least bit comparable. Jason – While I tend to agree with Mike and Martin’s comments (It doesnt matter who we are – it matters what we do and we don’t request trust – we give reasons) I can see that us posting as Seattle Subway is sometimes an issue for people. We have updated our STB bio to link to the bios of our communications team. The seattle rental market is not in a bubble. High rents are a symptom of our dangerously low (and still dropping) vacancy rate, not of a bubble. People are not going to start being squeezed out of Seattle due to high rents, they already are being squeezed out to the south. The only way to reverse this trend is to build more units and bring the vacancy rate back up to a healthier number. There have been a number of studies showing this, some posted here. Feel free to google them yourself or browse the archives. You seem to have some objection to this very straightfoward piece, but you’re not making it directly, instead claiming that the authors presumably don’t have the appropriate degrees. It would be a great deal more helpful if you’d simply say, directly and clearly, what you think is wrong with this argument. and lets not forget that all those who rent do not vote as much as those with vested (read: ownership) interests in a community. Are you trying to suggest that renters are less likely to use transit? That’s what the purpose of the population growth estimate here is, not how population growth affects voting. I’d imagine the new renters will actually tend to use transit at higher rates than owners, which skew the ridership calculation based on population underestimation even more. renters are probably more likely to use transit but less likely to vote (or be eligible to), therefore, it would be harder to get the votes to approve the financing for serving ballard from ballard itself. I disagree. Look at the precinct numbers for Ballard for any recent election involving transit. I don’t think is true, but even if it is, so what? You can’t possibly expect to carry an election of this sort only when you get approval from that area. Using that logic, we are doomed. We are already building the most populous line (downtown, Capitol Hill, U-District). We have no plans for the rest of the Central Area or Lake City (two populous areas). Ballard is fairly populous, but is not a majority of the city (not even close). Nor is any other location that is on the drawing board. The only way we can be successful is if a lot of voters who don’t personally benefit believe that the project(s) make sense. This was true before, and it is true now (the initial light rail line had very few direct beneficiaries). Really, I’m not sure what this has to do with this post, but I also don’t know what this has to do with any sort of planning. Do you think we should avoid apartment buildings? If so, how exactly are we supposed to have ridership that justifies light rail. Are the people supposed to drive in, or catch the bus? If so, then Ballard (or the entire area north of the ship canal and east of I-5) has plenty of home owners who would love to take a bus and then transfer to a fast train. I just don’t get your point, unless it is to suggest we are doomed, because light rail will serve renters, “renters don’t vote”, and only people who are directly served by a light rail line will vote to support it. I don’t think anyone doubts that today’s renters vote at lower rates than today’s homeowners. But if you adjust for confounding factors (age especially; maybe income and education as well) the difference is surely much less. If renters grow as a population, does that mean fewer people will vote because they’re renters or will the population of renters change in composition, causing its voting rates to rise? The reason we’re concerned about Ballard’s population and transit level is we believe density and transit are necessary for a well-functioning city. The percentage of Ballardites who vote doesn’t really come into it. However, the 45th/Market Street corridor heavily attracts people who want to take transit, want alternatives to driving, and are prepared to vote for transit taxes — both owners and renters. That pent-up demand is why we and ST expect the next line to be Ballard-south and/or Ballard-east. People have voted with their feet and moved there because of the existing transit, street grid, and walkability, and they’re expecting high-capacity transit as soon as feasable. So even if Ballard’s voting rate was zero I’d still recommend this plan because it’s what the city needs. I agree with your argument but remember to subtract the number of people who’s housing has been razed to build the new apartments, etc. Most of the density in Ballard is built on formerly non-residential sites. There was some displacement, but the displacement in Ballard is well under the citywide average. The point here is that even with the back of napkin math, it’s likely that Ballard will grow a lot more than ST studies indicate. That is important because the higher the population the greater the need for high capacity transit and the more competitive the project will be for federal funding. If the studies don’t even reflect the reality today, they can’t possibly reflect the reality in 20 years. We thought of that, but don’t have a good number to use. Citywide its 8/1 new to displaced housing, however, we know that most of the density in Ballard is built on non-residential sites so its likely much higher on the new side there. There was some displacement, but its well under the 1/8 number citywide. For the sake of brevity we consider whatever displacement happens and whatever permitted buildings don’t get built a wash with all the development that will likely happen that we don’t know about yet through 2017. So Ballad had, and will continue to have, incredible growth and development without “high quality” transit? Interesting. I believe the original upzone was in anticipation of the Monorail. Any upzone in a desirable area can be very powerful in our supply-limited city. I rather doubt 400,000 people will move to Seattle in the next 20 years. I agree that’s very unlikely (though would be amazing). But I also don’t believe the PSRC’s model that says Seattle will drop in population by 13% in 10 years (at least compared to our buildings that already have permits). I think this article is a call for a more careful look at the model. Well, sort of. They should be publishing ranges with confidence scores and updating them with new information. A single number is always misleading. Was it not the PSRC that forecasted 1.5 Million people coming to this region in the next 20 years? I think that is a credible number if not even conservative. We had best be aggressively planning for this growth. Where i would differ from the PSRC and indeed call for them to explain their methodology is the presumption that suburbs will carry the bulk of growth. That goes counter to trends happening in all major cities with people choosing to locate in urban cores. The current population growth rates of cities confirm this. Does this even matter? The ridership estimates will be reviewed when any project EIS is prepared. It matters during prioritization phases and when making public cases for which areas to build transit infrastructure in and how urgently to do so, long before the EIS phase. It matters because there is still time to fix it. That is why we are commenting in the context of the long range plan. You raise an important point – that the land use and demographic projections process is dated and thus is suspect. In other growing metro areas, there is often a more current tracking and adjustment forecasting process. I suspect that PSRC isn’t feeling compelled to be more current for a variety of reasons. I wish that PSRC would have a “current trends” series that is an unofficial preliminary forecast that isn’t massaged by lots of local cities and various elected officials and is based partly on trends in the last two or three years like permit records. We agree. We are just asking for projections that can pass a sniff test. PSRC’s 2013 numbers fail that. Being off by 18 years on a 22 year projection shows some pretty basic flaws in the model. This is the first reasonable projection I’ve seen. How long do you think people are going to pay three, four or five times the price of something they can get elsewhere (Colorado)? The thinking around here is still in the 1990s. Wake up. MS is preparing big layoffs. Do you think the 0% profit Amazon or the Boeing now competing with COMAC is the answer? We don’t have a Next Generation business here yet. So… A projection that is counter to what is/has already happened is reasonable. Got it. We have two decadal Censuses that show a decrease in growth rate of 90s compared to 00s. We then have some estimates which are not based on census data but on surveys and from rather light data and a sketchy source by my research. A sketchy source like existing and permitted construction? PSRC has been spectacularly wrong about Ballard growth for some time. This is just their latest. The difference is utterly trivial; the growth rate of just under 1% a year was stable for a couple decades. It’s particularly obvious that it isn’t a slowing trend when you look at 2010-2014, during which the city will add roughly the same number of people it did in all of 2000-2010, more than doubling the annual growth rate of recent decades. I know you believe people shouldn’t want to live in Seattle because people are supposed to hate density. But you’re not entitled to make up facts that conform with what you want to be true. I just rad that Microsoft is laying off 1,351 of 43,000 on the Seattle area. While not insignificant, and while certainly it’s devastating for the people involved, is that enough to slow growth significantly in the area? I just read, not rad. Norah – Short answer: no. I didnt realize the layoff was that small locally – I think they are laying off 14k nationally. Right now, there are jobs elsewhere in this labor market for those workers. If anything a minor layoff on the eastside might actually accellerate growth in Seattle proper if those workers find work on this side and decide to move. From what I understand most of the layoffs are actually in Europe. John, a majority of the layoffs at Microsoft are occurring at the former Nokia and in Europe. I’ll worry about COMAC when someone other than a Chinese government owned airline orders one. Boeing and Airbus are going to be plenty busy meeting the demand for new wide body and narrow body jets during the next decade. From what I saw of the whole process I cannot say I am impressed. Portions of it seems overly complicated, portions of it focus on fantastical modes and corridors, while totally ignoring current needs. While an update of the master plan is needed, there are still far too many unmet needs in the current plan to be drawing lots of new lines on the map.